Joey Bosa has played multiple positions this season. Joey Bosa is doing more for Ohio State in 2015 even if his stats have yet to start adding up like they did last season. The reigning Big Ten Defensive Player of the Year barely cracks the top 20 on the conference’s tackles for loss list midway through the regular season, though that is as much a reminder of how deceiving stats can be as anything else. 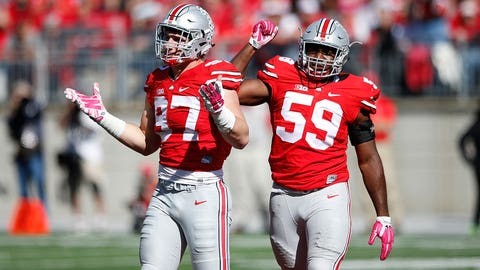 Watching the Buckeyes play makes clear opposing offensive coordinators have not forgotten about Bosa, who is frequently the focus of blocking schemes and can still be seen in the backfield regularly even if someone else is cleaning up the havoc he might have caused. And now Ohio State has a plan for making him harder to find during game planning meetings. After occasionally kicking down to an interior spot last season (including for his famous "walk-off sack" at Penn State last year), Bosa was spotted there multiple times during the Buckeyes’ win over Maryland last week. Per BuckeyeSports.com, Ohio State calls its scheme with Bosa at tackle along with regular nose tackle Adolphus Washington and ends Tyquan Lewis and Sam Hubbard (who replaces regular "three-technique" tackle Tommy Schutt) its "rushmen" package.